4 What about Guide data? With 0.26, a new feature was added allowing you to record various HTTP Live Streams (HLS). 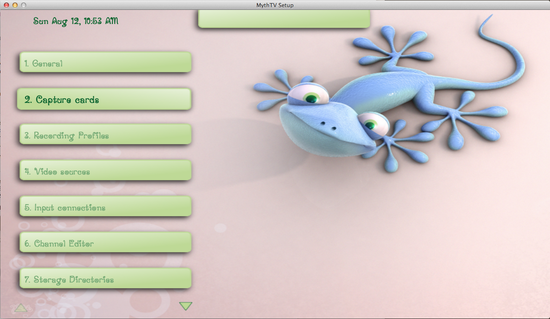 It works in a similar fashion as the IPTV recorder, using a single playlist containing a list of HLS streams. The link provided must be to a HTTP Live Streaming playlist. 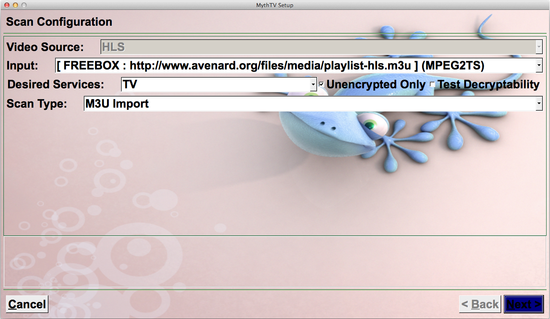 And go into "Capture Card" and select "New Capture Card"
As card type, select "Network Recorder"
In "M3U URL" enter the link to the M3U playlist as described above, you can use http://www.avenard.org/files/media/playlist-hls.m3u. 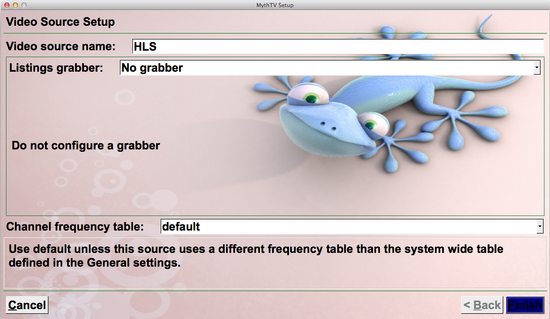 In the main menu, go into "Video Sources"
In "Video source name", enter HLS (or whatever you wish). In Listing grabber: "No grabber"
In the main menu, go to "Input connections"
And select the FREEBOX recorder you've just entered above. In "Video source", select the video source you entered earlier, in our example "HLS"
Click on "Scan for channels"
Click on Next, and Finish. No channels will appear, but that's normal. If you now go into the "Channel Editor" you will see the list of channels. Going into Live TV will allow you to select one of the newly added channels. If you want to set up recordings ahead of time, you need some source of guide data. 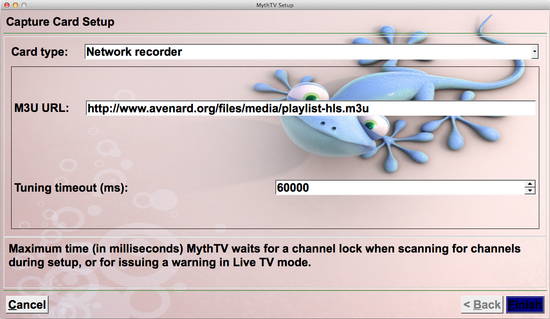 Like any other recorder in mythtv, you need to provide a XMLTV feed and set the xmltv id for each channel. The guide data goes into the XMLTV feed, but collating it is a signficant effort. You'll probably be screen scraping and will have to deal with low-quality episode descriptions, along with lots of repeats (not flagged as such). 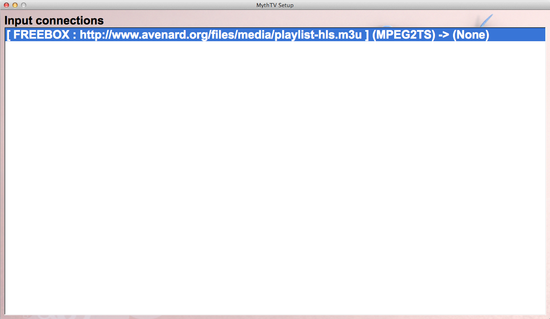 An (umaintained) attempt to do this can be found at http://www.avenard.org/iptv/TPG_and_IPTV/EPG.html.